Looking back after 12 years of feature filmmaking under Pixar's belt it's a remarkable string of successful and entertaining films - no duds whatsoever. Yet, when watching "Ratatouille" last year, a sameness in tone was setting in. Of course the audience for these films are kids first, adults second, but with the immense creative potential for the medium I couldn't help think it was time to break from the formula and create something truly groundbreaking for the medium/genre. “Wall-E” manages to do just that - almost. This time director Andrew Stanton and the Pixar bunch go back to their earliest pre-Toy Story short films for inspiration - visual storytelling, attention to detail and a healthy dose of gosh-darn cuteness. With very little dialogue "Wall-E" tells it's marvelous tale of a stranger in a strange land with the visionary delight and social consciousness of the great films of the silent era. The film also doesn't know how much of good thing it has, and devolves in the second half into Pixar autopilot which had me yearning to see the first half again. The setting is the future – Earth has become a wasteland of excessive consumption. Garbage is piled higher than skyscrapers and the extra large big box superstores are now empty shells. There is no one around, anywhere, except for one cockroach and one really cute robot, Wall-E. Wall-E is a waste disposal unit – about one foot square- like R2D2 meets Short Circuit. Every day Wall-E fastidiously goes about his business of finding junk, and either storing it in his small bachelor pad or squeezing it into stackable squares. One day a spaceship lands on earth and drops off another robot, Eva – a reconnaissance version of Wall-E, except sleeker, more streamlined, more advanced and (most likely) female. Wall-E bonds with Eva as he educates her on his simple way of life. When Eve is forced to return where she came from Wall-E hitches a ride to a giant big-box cruise ship for humans in space. The hustle and bustle of the new world is culture shock, but Wall-E is a survivor and he inadvertently sparks a revolution against the despotic tyranny of the evil Hal-like robot Otto and return the lazy, gluttonous humans back to earth. Let’s just get out of the way the fact that’s it’s thoroughly entertaining stuff for its entire 90mins and probably the best CG animated film ever made. Done. Now we can really talk about the near genius Pixar almost achieves and the frustration of missing that boat. The first third features only Wall-E and his mute cockroach friend. There is no dialogue, and so the film, like many critics have likened it to, is Chaplin-esque. Like the Little Tramp, Wall-E’s actions are like a silent dance of actions, movements and gestures. There's nobility in his work, but we equate his loneliness with sadness and words need not be spoken to convey the emotions of his sparse existence. Then Fred Willard shows up on a TV screen (a live-action Fred Willard) which made me think that this film may not be an animated film at all – that real humans might, for the first time, join in a Pixar film. I salivated at the potential of merging live action with Pixar animation. 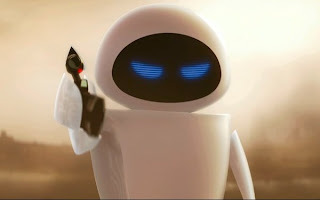 In fact, with Wall-E alone on Earth, I never felt like I was watching an animated film at all. The rendering of the robot, the cockroach and the wasteland locale looked as good as live action – certainly better than any world George Lucas has created. The second half is a different film. The inspired CG existentialism gives way to cartoon people – once again. The same animation of humans we’ve seen in every Pixar film before it. And there’s nothing wrong with that – it provides more than enough humour and exciting action to ramp the film up to a satisfying climax. But the disappointment, however slight, of not meeting the expectations it set in the first half cannot be ignored. Could “Wall-E” have sustained the inspired ingenuity within the self-imposed restraints of its first half? Most certainly. It’s a shame Stanton didn’t try, but he still delivered to us enough intelligence, visual brilliance and cuteness to consider the film a masterpiece of its genre. Enjoy.